. :: PENELOPE LEPREVOST (FRA) MAINTAINS THE LEAD IN THE SECOND DAY OF THE INDIVIDUAL COMPETITION AT THE FEI EUROPEAN CHAMPIONSHIPS, FRANCE TAKES CONTROL IN THE TEAM COMPETITION ::. In a display of controlled and precise riding, France's Penelope Leprevost, riding Flora de Mariposa, maintained her first place in the Individual competition at the FEI European Jumping Championships in Aachen, whilst France took over from Germany at the overnight leaders of the Team competition. 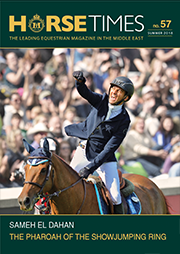 The top four places remained unchanged from the first day of the competition with Penelope Leprevost, Ludger Beerbaum, Joe Clee and Gregory Wathelet all jumping clear on the second day of these Championships. Spain's Sergio Alvarez Moya broke into the top five with a clear round aboard Carlo 273. In the team competition, Penelope Leprovost's second clear round was matched by team mates Simon Delestre and Kevin Staut, and with the four faults accrued by Jerome Hurel dropped at this stage, the French now go into the final day of the competition as leaders on a score of 5.700, ahead of The Netherlands on 7.820 and Germany of 8.400. "With my mare it was just a dream. She was so easy to ride. In the team competition we have clear rounds today but it will be a difficult competition tomorrow." "Today was the team competition, and that's what counts. You need good rounds or you are going down the standings. I am really pleased with my horse and remain hungry for success, but there is still a long way to go." "My horse has been jumping great - I was more relaxed today than yesterday, but the team is taking each day as it comes and with success here comes Olympic qualification but one job at a time. This is the most amazing show in the world and I am really enjoying being here with the public. It's a bonus that everything is going so well but we have a job to do and we have to keep on thinking about the job in hand."